Expand your tablet features with OtterBox uniVERSE Case System. uniVERSE features two slotted rails and a center mount, letting you securely attach and easily swap out powerful partner accessories without removing your case. 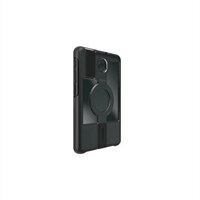 The tablet case offers an additional attachment point at the center for mounting solutions.